Liczba stron: 64 Jest to ujednolicona liczba stron, która ułatwi Ci porównanie długości książek. Każda strona Legimi to 200 słów. We began 'Conversations with Linda McCartney' on a quiet Sunday morning in Bath in the United Kingdom. That morning I had the strong emotion to contact her through Sussan. I said to her it might be possible that she wants to be in contact with us, would she attempt to contact her and open a channel. What I discovered about Linda through our forty minute channeling sessions was a very real loving person in the true sense who spoke candidly about her life with Paul and her children, her death from cancer and answers to my question of how this could have happened to someone so health conscious. I asked about her feelings towards Heather Mills and Paul's current wife Nancy Shevell, their children and life in general. The answers revealed a remarkable woman, compassionate, intelligent and very giving of herself towards her husband and children. However what shone in all our conversations was her deep love for Paul and her enduring love for her children and their well being now and into the future. Questions and answers revealed her feelings towards her life as the wife of Paul McCartney, the famous celebrity, and mother of her children. The reasons she saw for her passing and advice to other woman regarding breast cancer. Her answers are remarkable to say the least. One of the questions I asked her was how would Paul react to news that we have had spiritual contact with her, she shrugged her shoulders and said he would probably dismiss it. The other question was how would the children react to any news of the sessions with her and the answer was they were used to media interest in them and as a close family they would also be inclined to ignore it. Linda said they were all spiritual people in their own right, able and capable of making their own decisions on this matter. So please enjoy with an open mind, our conversations with Linda. If you are considering the purchase of this book, please be aware it is transcripts of channeling sessions with Steve Jobs who has passed over. The connection is through a channeling psychic medium. If personal or religious beliefs deny your acceptance of this connection to the other side beyond death, we strongly advise not to proceed with the purchase. This information is written with the best principles of integrity. It is not our intention to cause any discomfort or disrespect to the family in any way. We respect and accept you have your own personal viewpoint and beliefs and should it differ from our resource methods, we advise you to go no further, as this book may not be in line with your personal beliefs. The right of Ronald Ritter & Sussan Evermore to be identified as authors of this work has been asserted in accordance with Sections 77 and 78 of the Copyright, Designs and Patents Acts 1988. No part of this book may be reprinted or reproduced or utilized in any form or by any electronic, mechanical, or other means, now known or hereafter invented, including photocopying and recording, or in any information storage or retrieval system, without permission from the above mentioned authors. There is a perception amongst many fans of the famous that by listening to their songs, watching their films and reading snippets of gossip that they know them personally. Biographies and autobiographies tell a version of the individual celebrity from the viewpoint of the author. However ex-wives, wives, husbands, girlfriends, friends and colleagues present another version as they knew them. But no one really knows the soul of the person. When we present a channeling connection from the spirit of someone who has passed over, we are accessing their life's record from a non-judgmental viewpoint. There is no bias or misinterpretation as the record of that person is direct from the spiritual records. It is a connection speaking frankly and honestly about their life, not the public perception or a media grown persona. You may ask, What is a channeler? A channeler has the ability to channel messages from advance spirits usually to communicate spiritual wisdom about life and the afterlife. However a channeler can also connect to a deceased loved one, spiritual guides and angels. Many channelers work with the same higher-level spirit during their lifetime as does Sussan with Osiris. The non-physical entity speaks through the voice of Sussan, the host, using her library of words and emotions to express themselves, unlike psychic mediums who relay the messages they hear see or sense. Sussan only connects with a non-physical entity or spirit of a deceased person if the vibration is compatible. The memory of their existence is stored for eternity in what is known as the 'Akashic Records'. This is a remarkable method beyond our comprehension because not only do we access the memories and experiences of the person who has passed over but the discussions are interactive and we discuss subjects with the entity which are either in the past or currently in motion as we speak to them. Understand that time is only an earthly measure and does not exist in the Universe. We are people with integrity and understanding of whom we really are and our purpose in the world. Our sincerity is without compromise and we live our lives acknowledging the Laws of the Universe. We do not wish to impose our beliefs on anyone but will share our knowledge. 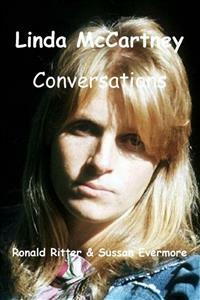 We began 'Conversations with Linda McCartney' on a quiet Sunday morning in Bath in the United Kingdom. That morning I had the strong emotion to contact her through Sussan my partner. I said to Sussan it might be possible that she wants to be in contact with us, would she attempt to contact her and open a channel. What I discovered about Linda through our forty minute channelling sessions was a very real loving person in the true sense who spoke candidly about her life with Paul and her children, her death from cancer and answers to my question of how this could have happened to someone so health conscious. I asked about her feelings towards Heather Mills and Paul's current wife Nancy Shevell, their children and life in general. The answers revealed a remarkable woman, compassionate, intelligent and very giving of herself towards her husband and children. However what shone in all our conversations was her deep love for Paul and her enduring love for her children and their well being now and into the future. Questions and answers revealed her feelings towards her life as the wife of Paul McCartney, the famous celebrity, and motherof her children. The reasons she saw for her passing and advice to other woman regarding breast cancer. Her answers are remarkable to say the least. One of the questions I asked her was how would Paul react to news that we have had spiritual contact with her, she shrugged her shoulders and said he would probably dismiss it. The other question was how would the children react to any news of the sessions with her and the answer was they were used to media interest in them and as a close family they would also be inclined to ignore it. Linda said they were all spiritual people in their own right, able and capable of making their own decisions on this matter. Please enjoy, with an open mind, the conversation with Linda and the responses to her life. Bon Voyage into a world that exists beyond our known reality. These sessions are the conversations and emotions that passed between Sussan, myself and Linda McCartney in late November 2012. How accurate are the results? It's a question without answer as all we have to go by is our honesty and past record of channeling many entities. The communication has not been altered except to combine different sessions that lasted over many days. Now let's hear Linda speak to us from beyond this physical world. Sussan closes her eyes and we wait quietly, however, Sussan says she can see Linda sitting in a room, it looks like a room in a old workman's cottage, very basic, unrenovated with a dirt floor, a single chair and a small window. Her arms are crossed and she looks annoyed and wants to leave the room but can't, there are now images appearing of her free and happy when she was younger doing the things she always wanted to do. At the end of her days she feels locked away without a door, trapped and isolated. She tells Sussan that although it was an incredible life with Paul but it was at times difficult.